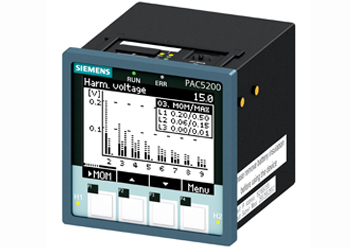 Siemens’ new 7KM PAC5100 and 7KM PAC5200 measuring devices from Siemens reliably monitor and log the power quality in industrial plants and buildings. Siemens expands its power monitoring system from the Sentron portfolio by adding the 7KM PAC5100 and 7KM PAC5200 measuring devices. Designed for use in industrial plants or buildings, the new devices record not only the entire energy data but all relevant parameters for assessing the power quality. A constant power supply in a defined quality is essential for the interference-free operation of numerous industrial production and automation processes as well as for the safety of electric loads. Potential internal or external interference in the power grid is identified by the new measuring devices at an early stage. Thus, it can be responded to immediately. The recorded details can be reported to the Siemens power monitoring system. Consisting of TÜV-tested, communication-capable hardware components and powermanager software for the visualisation and analysis of data, the power monitoring system creates the technical basis for an operational energy management according to ISO 50001. The compact 7KM PAC 5100/5200 measuring devices are used at the power supply or on an individual plant. There, they can record data on the mains frequency, on active, reactive and apparent power, on the reactive and active power factor, on phase angles, the harmonics of alternating voltage and alternating current up to the 40th order, and on the distortion of alternating voltages and alternating current. The 7KM PAC5200 measuring device comes with mean value, event and fault writing functionality, a logger for quality standard EN50160, and 2 Gigabyte (GB) of data storage for the documentation of long-term data. Users can read out all the recordings directly on the device as well as use the standard data formats PQDif and Comtrade for analysis purposes. Power quality events are presented in ITIC (CBEMA) curves amongst others. Plant operators can use the collected data to check if the power delivered by the energy provider has the contractually agreed quality and to renegotiate the contractual terms if necessary. Machine-builders, on the other hand, benefit from the devices to safeguard the functionality of their plants world-wide – regardless of country-specific fluctuations in the power supply. The measuring devices are commissioned quickly and easily. They have electrically separated voltage inputs and are equally suitable for installation in control panels and mounting on standard rails. They fulfill the degree of protection IP40. Parameterisation, diagnostics, analysis, and report creation are performed by the integrated web server. All data are recorded in standard-compliant format according to IEC 61000-4-30 and are comparable independent of the manufacturer. One of many recordings is the monitoring and analysis of the power quality standard EN50160 directly in the device or via the web server. Communication with the devices is handled via the Modbus TCP protocol.